A Pharaoh was all powerful, the high priest of the ancient lands temples, the head of government and believed to be half man and half God by the Egyptian people. Ancient Egyptian Pharaohs were the rulers of ancient Egypt in one of the most magnificent and mysterious eras of Egyptian history. Egyptian Pharaohs began their rule in the early Dynastic period which lasted until the the Ptolemaic Dynasty when Egypt was conquered by the Romans and came under the control of Rome. There was a total of 170 Pharaohs that ruled Egypt during the three thousand years that Egyptian Pharaohs ruled ancient Egyptian civilisations. 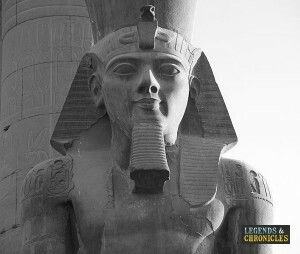 These Pharaohs were considered the divine deities and ultimate rulers of the land in those times. There were many different ruling dynasties during this great period of Egyptian history and it was a constant power struggle for the ruling families to maintain control as they had to deal with constant threats coming from within and from the outside world to their rule, as a result most Egyptian Pharaohs of these ancient times tended to be controlling and ruthless leaders. The exact word ‘Pharaoh’ refers to these god kings of ancient Egypt and it literally means ‘great house’ this term was mainly used for the royal palace. With the passage of time, the owner of the palace, or in other words the king, came to be known as the Pharaoh. The main principle among these Egyptian Pharaohs was to keep the rule within the same family which was done by frequent intermarriages between relatives. However, the ruling families did change during times of battle and infighting which gave ancient Egyptian history a complexed and dynamic nature. It is hard to pin down the exact dates of the Pharaoh periods. However, historians and archaeologists have managed to give an approximate number of years. According to known facts the Pharaoh period started from around 3100BC, a period which is called the Early Dynastic period. This Egyptian Pharaoh period is also known as the archaic period and is followed by The Old Kingdom and nine subsequent periods. The ancient Egyptian Pharaoh period finally ends around 30BC when Egypt was conquered by Rome and became one of its provinces. The last dynasty of the Pharaohs is known as Ptolemaic dynasty and it includes dynasties such as the Pharaohs as Ptolemy I, Arsinoe I, and others. The famous queen known as Cleopatra also belonged to this dynasty. The founder of the First Egyptian dynasty was Menes, also known as Narmer. He was the Pharaoh who united Upper and Lower Egypt and thus became the founder of the First dynasty of the Egyptian Pharaohs. This unification took place around 3100 BC and thus commenced the magnificent period of the Pharaohs. The Pharaohs kept switching between polytheism and monotheism as the official religion of the state. One of the rulers who reinstated the previously abandoned polytheism in ancient Egypt was Tutankhamun, he was famous Pharaoh who ruled from the Eighteenth dynasty onwards and was in charge during the period known as the New Kingdom. He is popularly known as King Tut. 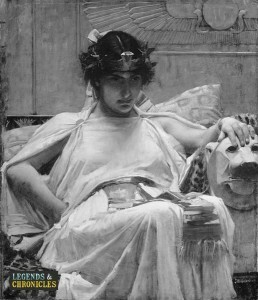 A painting of Cleopatro one of the most famous pharaohs of Egypt. Aten (God of Sun) in Egypt. Another ruler who ruled Egypt at the peak of its power was Amenhotep III, also known as The Magnificent King. The number of monuments built and statues erected during the reign of Amenhotep III was higher than all other Pharaohs. He also built the grand mortuary temple which was eventually destroyed by Rameses II. The founder of the famous Eighteenth dynasty was Ahmose I who naturally has a very special place among the ancient Egyptian Pharaohs. 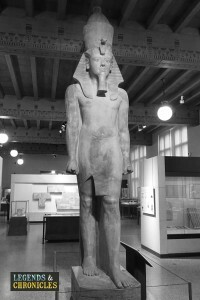 Other than inheriting the kingdom from the last Pharaoh of the Seventeenth dynasty, This great Egyptian Pharaoh also conquered the northern part of Egypt taking it from the Hyksos Asian people to establish his own vast kingdom. Amongst the women rulers of Egypt, the most fascinating character in the history of the ancient Egyptian Pharaohs was probably Cleopatra, she was a member of the Ptolemaic dynasty which had descended from the Macedonian Greeks and ruled Egypt after the death of Alexander the Great. After jointly ruling with her father and then brothers, Cleopatra eventually became the sole ruler of Egypt. She bore twin sons with the Roman general and politician Mark Anthony and fought with him against the Caesar. After losing the battle, both committed suicide. In the Eighteenth dynasty of the ancient Egyptian Pharaohs, we also find another woman who’s name was Maatkare Hatshepsut, she was the second known female Pharaoh. Maakare Hatshepsut was the fifth Pharaoh of the dynasty and was enthroned in 1478BC. The distinguishing feature of Hatshepsut’s rule was that it was longer than any other female Pharaoh. She has also been called “the first great woman in history” by Egyptologist James Henry Breasted. A stone depiction of Ramesses III, one of the mighty pharaohs of Egypt. The fame of the great pyramid of Giza is unrivalled in the history of Egypt and it was Khufu the great Egyptian Pharaoh ruler of the Fourth dynasty who built this magnificent structure, although remaining details of his rule have not been property documented. He was the second ruler of the Fourth dynasty and descended the throne after his father, Sneferu. One of the most famous Egyptian Pharaohs was Ramesses II, also known as Ramesses the Great, who was the third Pharaoh of the Nineteenth dynasty. He is generally considered the greatest and most powerful ruler of all the ancient Egyptian Pharaohs. He is also generally considered the Pharaoh who led several military expeditions to the Levant region and expanded the Egyptian empire. Another very important Pharaoh was Sneferu, also known as Soris, who was the founder of the Fourth dynasty of ancient Egyptian Pharaohs. His reign started around 2613 BC and extended till 2589 BC, during which he built three major pyramids which have survived until this day. The dynasties of ancient Egyptian Pharaohs form one of the most important and magnificent periods of ancient Egyptian history. The dynastic order was not necessarily linear since some dynasties ruled different parts of the ancient Egypt at the same time. Various other titles were also used to describe the ancient Egyptian Pharaohs, among them being ‘Lord of the Two Lands’, and ‘Highest Priest of Every Temple’. These titles make it clear that the Pharaoh was not only the political authority of the land, he was also the highest religious authority and the figurehead of God on earth. This period in Egyptian history ended as another great dynasty began with the overthrow of the Egyptian ruling class by the Roman ruling class who were just as magnificent and ruthless as the Egyptian Pharaohs had been.